Stars: Chris Pratt, Bryce Dallas Howard, Vincent D’Onofrio, Nick Robinson, Ty Simpkins, Omar Sy, Jake Johnson, Irrfan Khan, Judy Greer, BD Wong. It’s a little over twenty years since Steven Spielberg gave us Jurassic Park, the story of a high tech theme park where nothing can possibly go wrong… until it does. Way back in 1993 Spielberg delivered some state of the art special effects that realistically brought dinosaurs and velociraptors to life. Jurassic Park was penned by Michael Crichton, an author with an interest in exploring technology out of control, and it served as a cautionary warning on the consequences of tampering with nature. The film shared a few thematic similarities to his own 1973 thriller Westworld, which was also set in a futuristic theme park where the robotic exhibits went out of control. In the twenty years since that ground breaking film, digital special effects have advanced even further, and this fourth film in the franchise certainly showcases some brilliant effects that bring the dinosaurs to life and seamlessly incorporate them into the live action. Jurassic World works best as a direct sequel to Jurassic Park and a reasonably successful attempt to reboot the franchise that has remained dormant since 2001’s Jurassic Park III. It’s almost as if those other two sequels don’t exist. Jurassic World is set on the island of Isla Nubar, where two decades earlier John Hammond attempted to establish his dinosaur theme park using genetically created dinosaurs. That experiment ended in disaster. But now, billionaire entrepreneur and developer Masrani (played by Bollywood star Irrfan Khan) has ironed out all the problems and has reopened the park with a brand new name and lots of inbuilt safety features. 20,000 visitors a day have ventured into the high tech park to experience the wonders of prehistoric creatures running wild. But dwindling ticket sales have suggested that the public have grown a little tired of seeing the same old same old. The corporate owners have grown nervous and demand something new that will attract investors. Masrani has urged Dr Wu (BD Wong), the head of his scientific team, to develop a new attraction. Thus we get the awesome Indominus Rex, a hybrid dinosaur created by splicing together the DNA of several creatures. When the inevitable happens and the fearsome and highly intelligent killing machine escapes from its enclosure only one man is capable of preventing hundreds of tourists from being eaten alive. That man is Owen Grady (Chris Pratt, from Parks And Recreation, Guardians Of The Galaxy, etc), a former Navy SEAL who now works as a raptor wrangler in the park. Only he has the skills and understanding of the dinosaurs to try and contain a situation that is rapidly spiraling out of control. Spielberg is still attached to the project as executive producer, but he has handed over the directorial reins to Colin Trevorrow, whose only other film of note was the ultra low budget sci-fi romantic comedy about time travel Safety Not Guaranteed. Trevorrow has been handed a multi-million dollar budget, and he makes it go a long way. He also shows himself to be quite adept at handling big scale action and special effects. There are a couple of superbly staged sequences here, including one scene where pterodactyls swoop down out of the sky and attack park visitors, a scene that is like something out of Hitchcock’s classic The Birds. And there is a massive smackdown between two giant dinosaurs that is far more exciting and brutal than anything we saw in the recent Godzilla. And I would much rather watch a couple of dinosaurs clawing and tearing at each other in a fight to the death than a couple of giant robots beating the living daylights out of each other any day! Jurassic World is exciting stuff, with plenty of action and lots of gore. The biggest problem lies with the script from Amanda Silver, Rick Jaffe and Trevorrow himself, which serves up some familiar ideas and a succession of cliched characters. Pratt established his leading man status and heroic credentials in his breakout role in the recent Guardians Of The Galaxy, and he is immensely likeable here. His Grady comes across as a sort of contemporary take on Indiana Jones, and he possesses the same sort of reassuring quality, quick wit and sense of humour. He is certainly the right man to rely on in a crisis. Bryce Dallas Howard plays a fairly stereotypical character as Claire, the buttoned up operations manager of the park, who alternately bickers and flirts with Grady as they outrun danger at every turn. 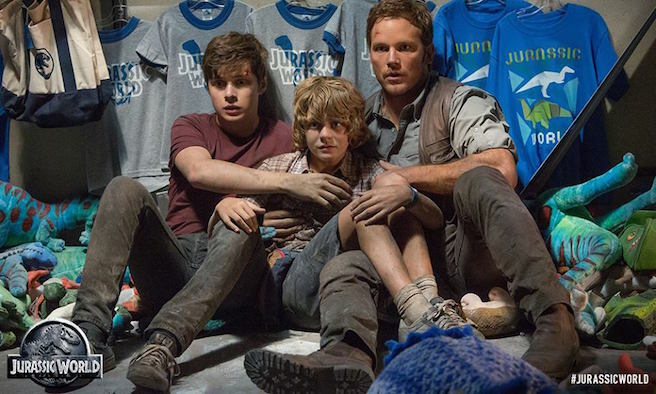 Claire was supposed to be looking after her two nephews – Zach (Nick Robinson, from tv series Melissa & Joey, etc ) and his curious, dinosaur obsessed younger brother Gray (Ty Simpkins, from Insidious, etc) – but they have wandered off and have become stranded in the middle of the park when all hell breaks loose. The two youngsters have plenty of screen presence, and they bring a credible human element to the story as they face plenty of dangerous situations. Vincent D’Onofrio plays Hoskins, the gruff and untrustworthy head of security, who is more interested in exploring the potential military applications of Grady’s trained raptors and seizes an opportunity to put them to the test when the Indominus Rex escapes. Omar Sy, who was excellent in the French comedy The Intouchables, has a small role here as Grady’s assistant, a role that doesn’t really give him a lot to do. Trevorrow and his co-writers have sprinkled quite a few homages to the original throughout the film though, which fans should enjoy – one character sports an original Jurassic Park T-shirt, which is described as being in questionable taste, and several character stumble through the overgrown ruins of the original entrance hall. Jurassic World is an effective piece of action cinema that delivers plenty of action and lots of gore – some moments are definitely not suitable for younger audiences -and it goes a long way to reinvigorating the franchise.